A row of people walking on the other side of the road. Brightly colored garland draped over-top of an apparatus some were wearing. Loud music blaring from loudspeakers on a truck at the rear, and a group of kids and teens drumming rhythmically at the front. Immediately feeling energized, I quickly motioned to the tuk-tuk driver to stop. I didn't know where in the Mawlamyine I was, but that was a worry for later. Feet now on the ground, I followed along as the procession made its way to a nearby Hindu temple. It was all a blur, with so much going on, I just tried to keep up and take it all in. The procession moves along a main street in Mawlamyine. 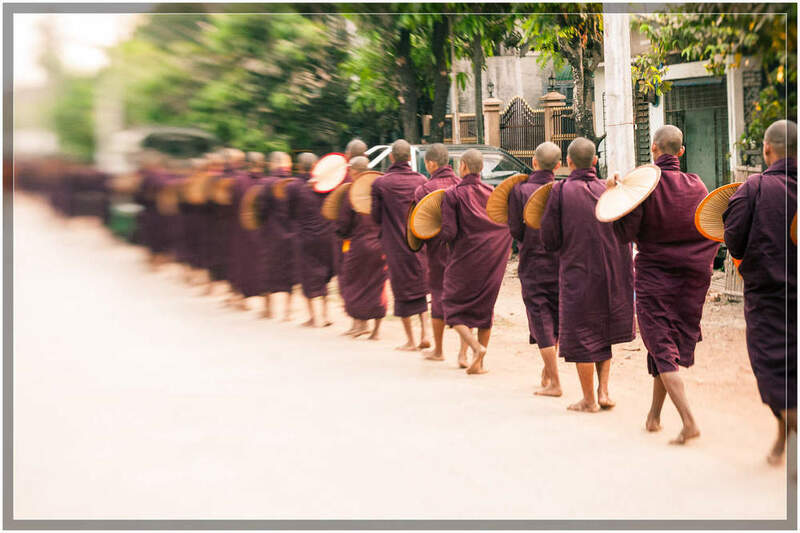 On the opposite side of the street (out of frame), Buddhist monks walk in the opposite direction. A Hindu devotee, decorated and pierced, makes the pilgrimage to the temple in the streets of Myanmar's third largest city, Mawlamyine. Kids and teenagers lead the way with their hypnotic drumming. 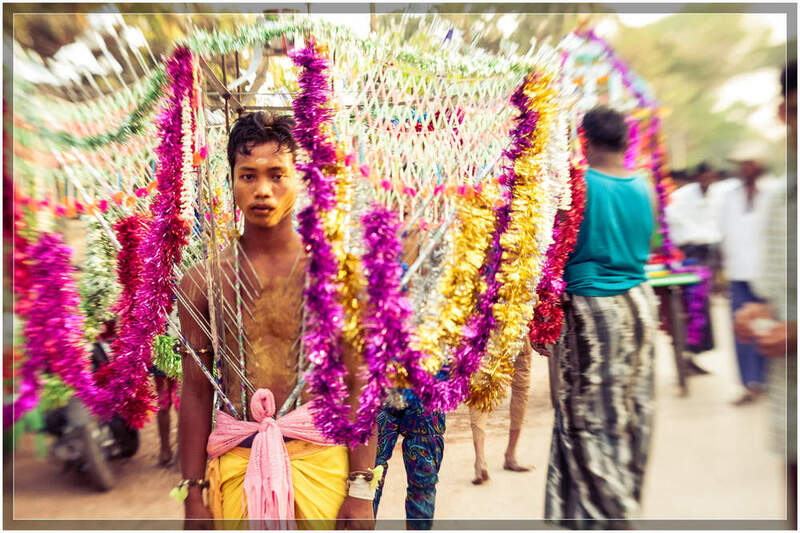 A devotee with his tongue and cheeks pierced slowly makes his way towards the temple in Mawlamyine. 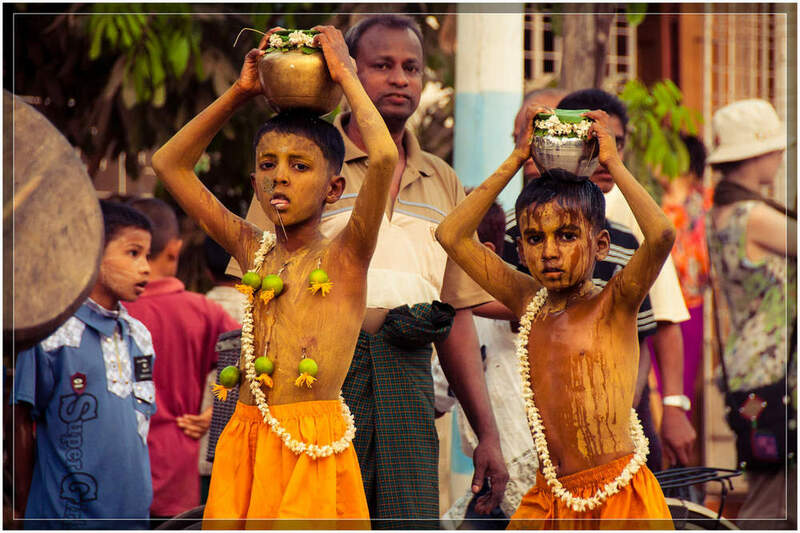 Children carry pots on their heads to show their devotion. One child has lime fruit hanging from hooks in his flesh and a skewer in his tongue. I was told that this man from the neighborhood has few belongings, but has faith that runs deep. His body had over two dozen limes hanging from metal hooks in his skin. 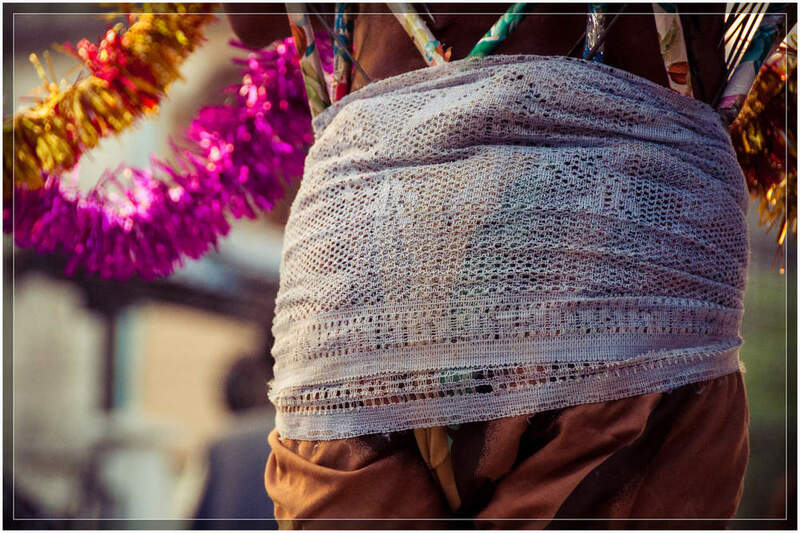 A devotee carrying a vel kavadi (burden) made of metal spears piercing his torso, with a decorated canopy overtop. The tongue is pierced to be a constant reminder of god. A wrap around the lower torso to prevent the movement of the spears while walking. Mawlamyine, Myanmar (Burma). A woman washes the feet of each of the devotees as they pass along the street during the procession in Mawlamyine, Myanmar (Burma). Hooks in the flesh are pulled by strings attached to carriages, pulled behind on what can be only be loosely defined as "roads." There is surprisingly little blood. 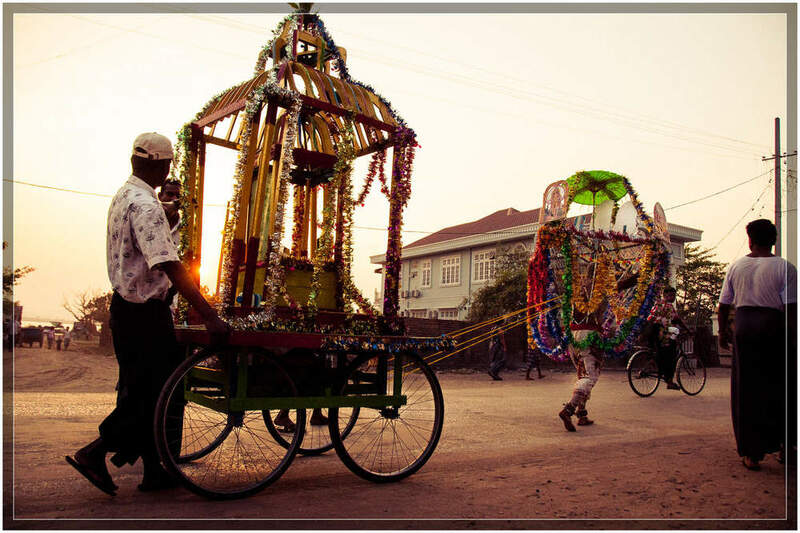 The devotee pulls the carriage down the road as the sun sets in Mawlamyine. 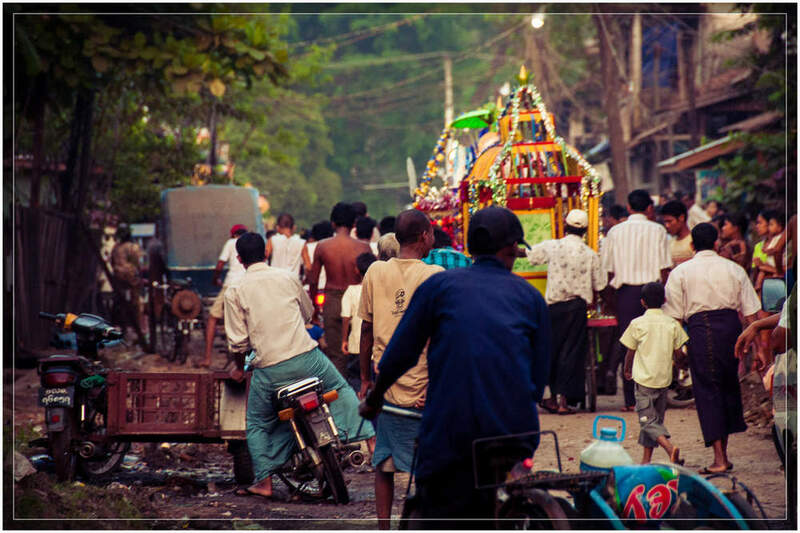 A child rides atop a carriage being pulled by a devotee in this Hindu ceremony. The procession continues down a side street en route to the temple. While comprising mostly of Buddhists, Myanmar (Burma) is home to people practicing many religions including sizable Christian and Hindu populations. Onlookers watch as the devotees spin and dance to the undulating beat as they enter the temple and the ceremony comes to an end. I don't know the exact ceremony that was displayed, and unfortunately language barriers prevented me from gathering all the details. 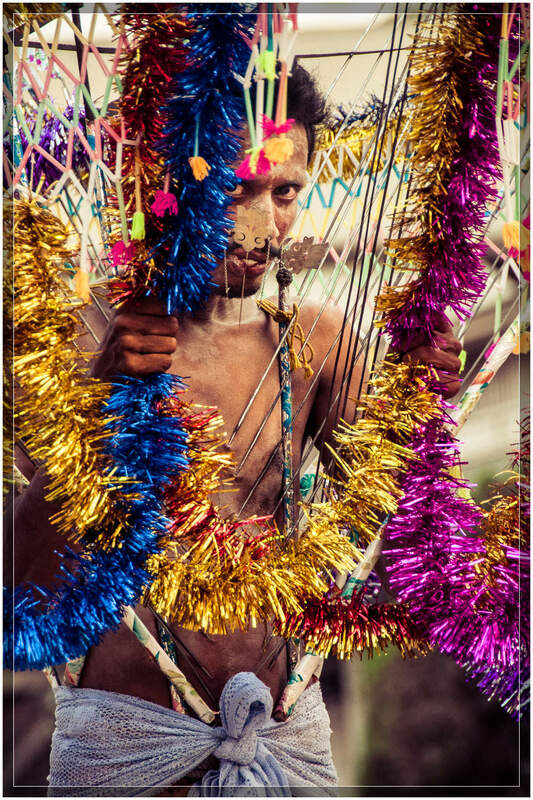 It seemed similar to the Thaipusam festival, but happened about one month later in March of 2012. I'd love to hear what you think in the comments below, and if you think you may know others who may enjoy it, feel free to share. If you liked this, you may enjoy my other stories and images from Myanmar (Burma), and my photo stories including "12600 Monks, One Street" and "Unreal Antarctica"